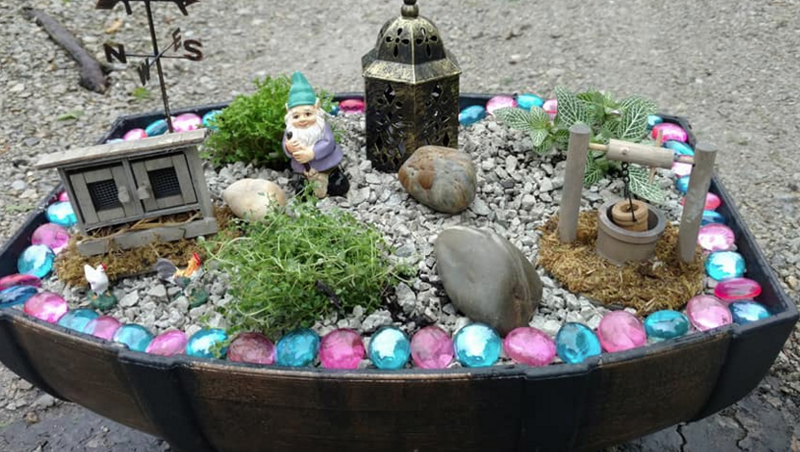 10 of Our Favorite Fairy Gardens – Made by you! 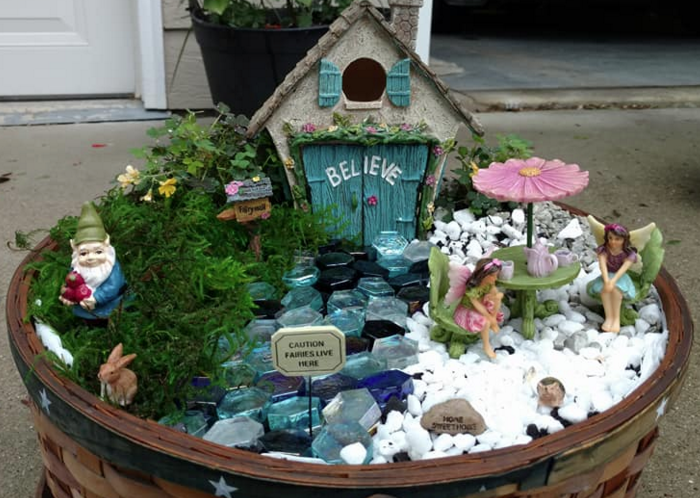 It’s one of our absolute favorite things to see Fairy Gardens shared by our local customers. Here are some of our favorites, filled with inspiration for making your own with help from supplies from our Fairy Garden Department. Plus! We’ve sprinkled in some of our best Fairy Garden tips. EXPERT TIP: In Containers with no holes, like a birdbath, make sure to add a layer of pea gravel at the bottom to give a place for extra water to go to help avoid overwatering. This will help keep your container from getting overwatered and keep your plants happy and healthy. EXPERT TIP: Use plants that are slow-growing and well suited for miniature gardens, like the Scotch Moss and Mexican Heather used in this Wooden Wagon Garden. Click below for a list of our favorite Fairy Garden Plants. EXPERT TIP: Fairies love the sound of babbling brooks and running water. Place you garden near a water source and you’ll be sure to have fairies pay your miniature garden a visit. EXPERT TIP: Fairy Gardens can also be play gardens. They are great to have in the garden to give the kids a place to call their own where they can get their hands dirty and play with as they please. We love this garden’s farm theme. EXPERT TIP: There are so many different things you can use for as containers for your Fairy Gardens. As long as your container is not too deep and has drainage holes (you can add them), it’s fair game to use. This Fairy Garden in a repurposed rustic wagon is too cute! EXPERT TIP: When making a Fairy Garden with the kids, incorporate some of their favorite toys. They’re less likely to break, often the perfect size, and they help cut down on cost! This Princess Sofia Garden is perfect for your little princess. EXPERT TIP: One of our favorite must-have Fairy Garden accessories is moss. It will retain it’s green color and is easy to use…just tear and place as you please. Find Preserved Moss in our Floral Department! EXPERT TIP: Roam the outdoors for extra items to add to your fairy gardens, like rocks and sticks. Nature has plenty to discover to incorporate into your garden. EXPERT TIP: Mix different terrains with rocks, marbles and moss to add interest and color to your garden. The different sections of this fairy garden make it beautifully varied. EXPERT TIP: Did you know? Fairies love company! Especially from Gnomes, who help them carry out much-needed tasks in the garden, like the Gnome above who’s sweeping away!